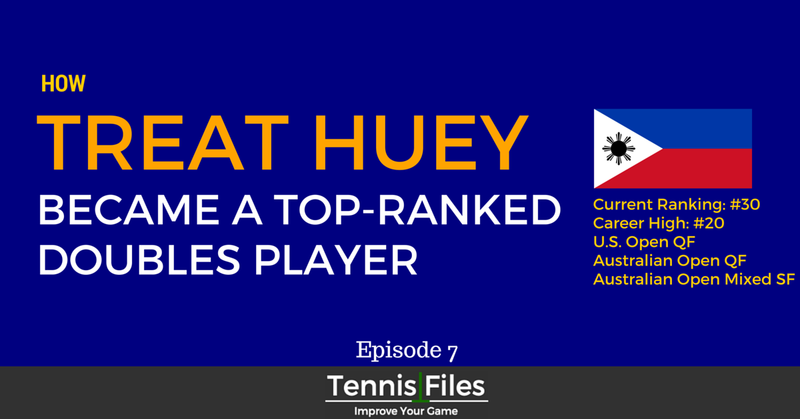 Treat Huey, ranked #30 in the world on the ATP doubles tour, is my guest on today’s episode of The Tennis Files Podcast. At the 2016 Australian Open, Treat reached the quarterfinals of the men’s doubles with Max Mirnyi and the semifinals of the mixed doubles with Andreja Klepac. He also reached the men’s doubles quarterfinals of the 2013 US Open and the 2014 Australian Open. Treat is a friend of mine who I met while playing junior tournaments in the Mid-Atlantic section. He is a talented athlete with a wicked lefty-serve and amazing volleys. Treat’s passion for tennis and mental fortitude has made him one of the most versatile doubles players in the game today. He has played numerous Davis Cup matches for the Philippines. Treat was also ranked #4 in college in singles, behind John Isner, University of Virginia teammate Somdev Devvaarman, and Kevin Anderson. I truly admire Treat’s professionalism, his competitive drive, and his impressive rise to the elite levels of the game. Treat tells us how his love for the game and belief in his abilities helps him be one of the best doubles players in the world.